I made my way to Washington this weekend and my wife told me I wouldn’t have time to fish so I didn’t take my fly rod or any other fishing gear at all. We were there for my sister in laws graduation but that was on Saturday. When we arrived on Friday we got our hotel room, hung out for a bit and then my wife said we had free time and I should go fishing! Go figure! When I usually go to Washington I go to Othello and this time we were in Seattle/Kent. We decided to go to a public lake/pond so I went to the local Wal Mart to pick up a 1 day license. I had to pay $20 to fish for one day since I am from California. My brother in law paid $10. When we arrived at the park, there were guys walking by us with limits of trout and every one of them answered that they were catching them on powerbait. One guy had a fly rod and we talked a bit about fly fishing which was cool; I felt like I was part of a secret club or something. He had been catching them on an olive wooley bugger. We looked at the pier and then noticed one guy who was slaying the trout off of powerbait. I hate to accuse a person of anything but this was more of an observation than an accusation. The guy was pulling out fish after fish and keeping them all. I saw him pull out a limit in about 15 minutes and he just kept fishing and throwing them in his bucket. There is no telling how many he pulled off before I got there. We used my brother in laws rods but he had 15-20 lb test on one of them and a thick braid on the other. I knew that if we were going to catch something, it was going to be difficult. While at walmart I picked up some tiny trebles, some small weights and he had swivels. What was the one thing we forgot? POWERBAIT! All we had was worms. I tried to recycle some power eggs that I found floating around but then we found another problem. The line was too heavy and we couldn’t cast them out far enough. My brother in law had one bobber so I decided to try a nightcrawler on a long leader. I ended up getting one takedown but it didn’t materialize into a fish. All of this took place in about 45 minutes and before we could even make a powerbait run, one of those famous Seattle storms came. I had my rain jacket on but not rain pants. My Brother in law had no protection and was getting soaked. The rain eventually turned into hail as we found cover. It looked to be a short storm so we waited for a while until it calmed down. We found another spot and fished for another 5 minutes or so before the storm got strong again. At that point we went back to the car and called it a day. 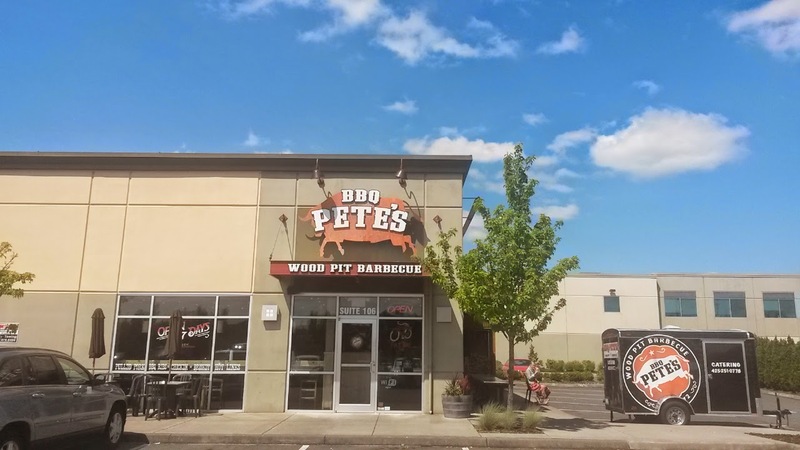 Unfortunately there were no fish but I did get into some pretty decent BBQ at BBQ Petes in Kent, WA. If you guys are ever in the area, give it a try. Sorry you didn't have any luck brother. Always hard when those unexpected opportunities present themselves. That is the way it goes fishing for stockers. I always had more luck in ponds floating nightcrawlers three feet off the bottom. You should have called the poacher hotline on that dude who was poaching, because screw poachers. Look at that licence you paid for. About 90% of the time it is printed on it somewhere. I agree with Daniel on the poachers. Remember what Charlie from the fly club said about your fly rod. It's like your American Express card, don't leave home without it. I don't care if the trout were only stockers, regs are regs, no one automatically get a bye on fishing limits. Time for a good cell phone and a camera! Very true. I didnt even think to record him.